I was having a discussion on bookmarks in Word with a friend, and he suggested me to check out his implementation of a query in Word. Since I did not have Microsoft Word installed, I told him I don't have Word so I won't be able to test it. To this, he mentioned that he'll send the executables and it will work - I argued that without an installation this will fail. How's this possible? I've never installed Microsoft Office on my system, this isn't any "portable" app or VMWare ThinStall ( thanks nhinkle, didn't know about this). There are absolutely no Microsoft Office related files - except for winword.exe and excel.exe. Curiously even Microsoft Excel works fine with just the standalone executable. 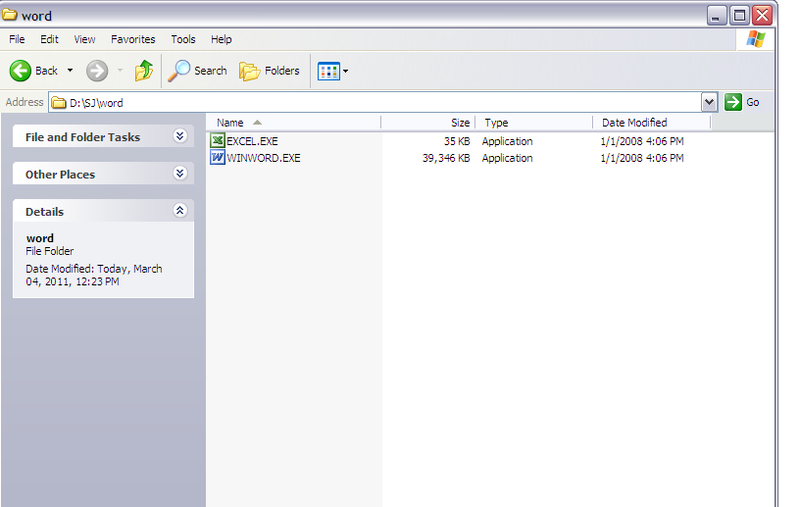 winword.exe size is about 39 MB, and excel.exe size is just 35kb, which makes it even more strange. I'm running on Windows XP, the files were from Office 2003. VMWare ThinApp is what you are seeing. I've done some testing while it was still called Thinstall and then VMware bought it. It's nice because it allows you to use Office 2003 / Office 2007 / Office 2010 and many more applications like IE6, IE7, IE8 next to each other. You run Thinapp again and it finds the changes with last snapshot and packs it up. This even gets better. You can install NET, Java after the first snapshot and then application that uses NET or Java. And then use the application created with ThinApp on system that doesn't have NET or Java Installed. Just to add the size difference is because Excel will use Word packed files. If you move away Word application Excel won't work. Though my suggestion was originally denied ;), based on your observations I was probably correct after all: your friend must have had a copy of Microsoft Office which has been virtualized with VMware ThinApp. First, I verified that a copy of the regular winword.exe and excel.exe would not work by themselves. I installed Office 2003 in a Windows XP VM, then copied them over to a different VM which had never had Office installed. Both applications failed to run. Check back in %APPDATA%\Thinstall\ and see if the Office 2003 folder has reappeared. If it has, the application is definitely using ThinApp. We use a ThinApp-wrapped version of MATLAB at my university; it has to have a .dat file present with all of the program contents. Depending on the requirements of the application though, this may not be necessary, which appears to be the case with these office programs before. Essentially, what ThinApp does is it virtualizes the entire directory structure and registry for the application. This allows for the application to be portable and to run without interfering with the system. ThinApp also supports network licensing, so if you have an application (like MATLAB in our case) that your organization has a finite number of licenses for, it can check in with the licensing server before launching the application, and only launch it if it successfully acquires a license. That directory in %APPDATA% contains the folders which ThinApp virtualizes for the application. Anything that would normally be in Word's %APPDATA% folder, like personal settings, gets saved here instead. Because of this, no matter where you launch the executable from on your computer, the settings will be preserved on that machine. They do not get transfered with the packaged application itself however. This becomes relevant when trying to reset the settings for an application which is packed with ThinApp, as the usual method of deleting its folder in %APPDATA%\Program Name doesn't work - you have to find its virtualized folder. It's not because the application is called WINWORD.EXE and the icon is the same that it is the exact same application that is shipped in Office. All Office applications have a digital signature. Right-click the winword.exe and excel.exe files and check if there is a Digital Signatures tab. You will notice those applications don't have a signature at all let alone one from Microsoft. The applications you have are probably self-extracting executables, which contain modified files of Word 2003 so it will run without being installed. If you have 7-zip installed you can try to unpackage winword.exe and see for yourself. Not the answer you're looking for? Browse other questions tagged windows-xp microsoft-excel microsoft-word microsoft-office-2003 or ask your own question. How do I remove or disable downloadable fonts in Microsoft Word and Excel?